Upasana Nattoji Roy is a designer, filmmaker, and animator based in Mumbai, India. She studied design, film, and animation at the National Institute of Design in Ahmedabad. Her first professional work, a class project that was chosen by the client, was the creation of the identity for the country’s national sports channel. In 2000, she began her career in the On-Air Promotions department of Channel V, a music channel, and for the next three years she made several independent films, which were selected for inclusion in multiple international film festivals. She soon moved on to working on live action shoots and animation for television and film, accepting a senior producer position in Dubai at television channel Dubai One. 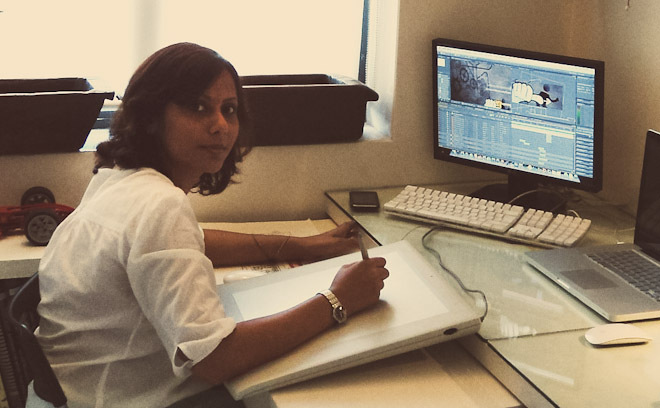 In 2008, she moved back to India to work on Aagey se Right, a UTV Spotboy film, the titles of which were a finalist in the 2012 SXSW Excellence in Title Design competition. Currently, Upasana works at Switch!, a design and animation studio she founded, where she creates short films, design and animation, packaging, commercials, and main titles.